Lady Gaga is a beloved pop culture icon. While her musical talents are undeniable, one of her signature calling cards has always been her fashion sense. She is not afraid to take risks when it comes to her style. This pop star can turn anything into an outfit, whether it be raw meat, a starched Shakespearean collar, a telephone receiver or a giant octopus. It seems that Gaga does not set foot on the red carpet unless she knows her outfit will be the one everyone will gossip about. Last Monday, on Oct. 15, all eyes were on the global icon while she attended ELLE Magazine’s 15th annual Women in Hollywood celebration, wearing a colossal suit fresh out the Marc Jacob Spring/Summer 2019 collection. While the menswear look was a definite statement, it was not until she took to the stage to deliver a powerful speech did the audience find out that this look had a deeper meaning behind it. 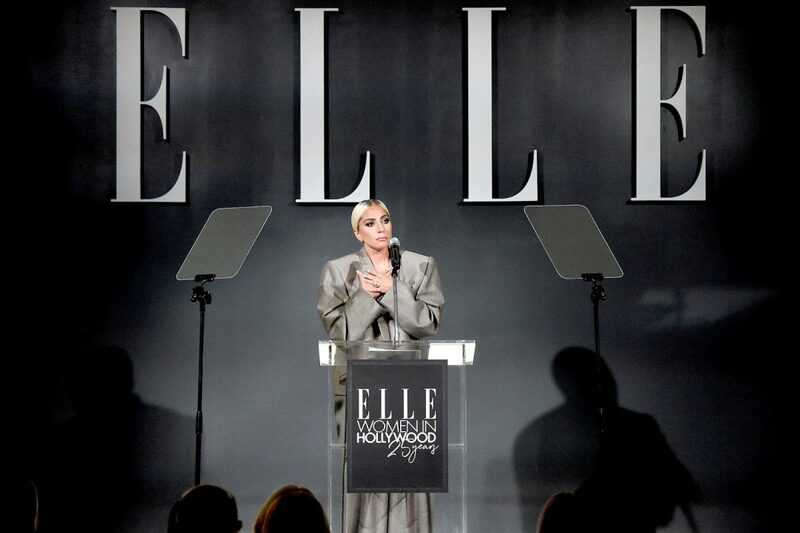 Gaga told the audience that as she got ready for this event, she began to think about systemic injustice against women in Hollywood. “In this suit, I felt like me today,” she continued. “In this suit, I felt the truth of who I am well up in my gut. And then wondering what I wanted to say tonight become very clear to me.” She then talked about her struggles with surviving sexual assault from someone in the entertainment industry and being tired of men telling her what to do for so long that day, she took the power back by wearing the suit. This sharp commentary was somewhat shocking coming from a star who appears from the outside to have imposed a strong and singular point of view on her style. Much more so than the many singers who have tried to stay in trend and get closer to mainstream likability, Gaga has expanded the definition of pop music, sexiness and fashion. However, that she was still brought to tears by how choosing to wear a suit over a gown is a testament to the narrow boundaries of Hollywood femininity. It also shows the persistent pressure placed on famous women to follow only a few archetypes of sexual desirability. Lady Gaga’s style has become embedded in her identity as an artist. As early as 2010, one of her first and probably still most famous outfits — the meat dress — already demonstrated that Gaga has actively used her own image as a medium to have her voice heard by the public. Her fashion statements have long allowed for layers of interpretation. As Gaga herself said at the VMA awards which — she attended in the meat dress: “If we don’t stand up for our rights soon we’re going to have as many rights as the meat on our bones. And I am not a piece of meat.” The dress was a feminist statement, a proclamation of her identity as a talented woman in charge of her own image. “It has a lot of interpretations,” Gaga later admitted on the Ellen DeGeneres show. She claimed that the meat dress was tied to her decision to walk the white carpet with gay and lesbian military members, to voice her protest against the military’s “don’t ask, don’t tell” policy. In her speech, The Prime Rib of America, she pointed out that the law prevents the military from enjoying “the greatest cut of meat my country has to offer” and that the dress was meant to deliver a message for equality. Despite her well-meaning intention, some people have viciously criticized her many looks merely because of their lack of femininity. A critic from Italian Vogue commented, “Lady Gaga’s flag is waving triumphantly from the peak of ugliness.” It was indeed shocking to realize even a star as successful as Lady Gaga would still face the difficulty of choosing between boring and desirable, and unconventional and intriguing. However, we, as members of the mainstream audience, regardless of gender, are all responsible for shaping attractiveness with such a limited definition, which many Hollywood stars and ordinary people have decided to follow. I believe a lot of us love Lady Gaga because she always makes the latter choice — unconventional and intriguing. We have used the term “dress to impress” for so long that we limit fashion to what is deemed “trendy” or “in,” instead of utilizing its potential to lift up our voices. While we appreciate fashion as work of art, the artistic subtlety of it is what makes a political statement more vivacious. It may not be easy nor necessary to show up in a dress of raw meat. However, we should still empower ourselves with the passion we wear on our sleeves and be a force for change.